And call NO "man" Father upon the Earth: for one is your Father, which is in Heaven. CREATED BY THE KABBALA / TALMUD / MISHNA BY THOSE WHO CLAIM THEY ARE JEWS BUT ARE NOT! 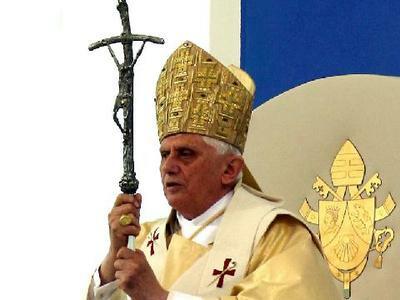 Joseph Ratzinger (81) assumed the Mantle "Pontifex Maximus" (High Priest of this Luciferian System of Satanic "SUN" worship) of (Sol Invictus) on 4-19-2005 – a title which began in 46 BCE! He was "Head" of the Inquisition for 14 years! 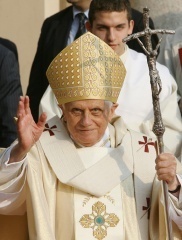 "Pope Benedict XVI" in costume. He leads the Curia, the same organization the Pontifex Maximus of Rome set up under the ("SUN"-worshiping) Caesars. Many of the same statues used by the Pagan Mithraic culture (MITHRAISM) have been re-named such as Eve=Athena, Noah=Poseidon etc. Not only are statues/images used, but also many other Pagan articles: holy water, medals, scapulars, steeples, bells, rosaries, candles, costumes, the Kyrie Eleison, the calendar, solar-shaped wreaths, domes, relics, crosses, and former Pagan feast dates revised (to put a Scriptural spin) on things, blending the Satanic model with new terms and meanings. "Ishtar" became "Easter", and Christmass became the Birthdate of the "Sun" (Lucifer's birthdate) December 25th.. The solar image, (the crux), became the central symbol of Christianity during the 4th century; under CONSTINTINE!. The 2ND Greatest symbol of LUCIFER "SUN" worship Today is the Washington Monument; (STANDING ERECT BEFORE THE CAPITOL BUILDING (PREGNANT MOTHER EARTH) WITH "MARY" (FREEDOM) SITTING ATOP! (ATHENA / MITHRAISM); it is the SECOND largest obelisk / male phallus on the Earth. THE LARGEST IS IN TEXAS. It's sum = 666. Directly from Babylon "MYSTERY" Religion. WHO MURDERED CHRIST? THE PHARISEES AND THE ROMANS! READ JOHN 18:36 AND JOHN CHAPTER 8! THOSE IN ISRAEL ARE "NOT" JEWS SPIRITUALLY CIRCUMCIZED; NOT FLESSHY. ( THOSE WHO SAY THEY ARE JEWS BUT ARE NOT! ARE OF THE SYNAGOG OF SATAN. The Jesuits / BLACK POPE (JESUIT GENERAL) DIRECTLY UNDER ZIONISM (KABBALA / TALMUD ARE ATOP EVERY RELIGION AND EVIL UPON THE EARTH; DIRECTLY UNDER SATAN and control every secret society, (all off shoots of the church) / "SUN" worship. They simply keep it from their flock to keep the superstitious ignorance alive and their coffers filled. PENANCE, PURGATORY, SALVATION… The greatest theatrical production in the world!
" Crowns in the shape of fish heads (MITRES) were worn by the Chief Priest of the Babylonian cult to honor (Dagon) the fish god. The crown bore the words " Keeper of the Bridge" symbolic of the "bridge between man and Satan". This was later adopted by the Roman Emperors who used the Latin Title, " Pontifex Maximus". One must realize that "EVERY" KING, QUEEN, PHAROH, CAESAR, AND POPE all (DEMANDED) and were worshiped as, and carried the title: Pontifex Maximus (god-man on earth); the SUN'S Earthly-human representitive in the flesh! This is SOON to be implemented (worldwide) ONE ~ FINAL~ TIME. THE WAFER ("SUN" ~ DISK) IS USED DURING "MASS" PRETENDING TO BE MESSIAH; BUT IN REALITY IT REPRESENTS THE BIRTH, DEATH AND RESURRECTION OF THE "SUN" INTO THE UTERUS OF THE SEA, DAILY; AND ONCE A YEAR ON DECEMBER 25TH. (LUCIFER "SUN" WORSHIP / BABYLON "MYSTERY" RELIGION / 666. AS IS EASTER "SUN" ~ DAY – "SUN" ~ RISE – SERVICE! PRESENT AND (FINAL WORLD LEADER) / (A Religious GLOBAL Dictatorship set up in Jerusalem! Remember that at Mount Sinai, as a result of their sexual idolatry, God turned them over to worship the (heavenly) host. Tammuz was worshiped by the women at the temple of Jerusalem while the men with their backs to the temple of YESHUA, Worshiped the Sun / (rising in the East) ALSO Easter SUN-day-SUN rise service. (Ishtar) Ezekiel 8:14-18. HERE IS WHAT GOD SO DESPISES! LUCIFER "SUN" WORSHIP (BABYLON "MYSTERY" RELIGION) 666. This is MAN'S "ORGANIZED RELIGION"; the "Organized Religious System (trap) upon "ALL THE EARTH"! (PAGANIZED CHRISTianity) / CHURCHianity, Baptism, CHRISTening, steeples, OBELISKS, PHALLUS, crosses, graven images, beads, hot cross buns, every pagan holy-days, prayers being seen of men, passing plates for money, tithes, christ "MASS", easter- (ISHTAR), Mayday = Beltane day…. trinity, Jesuit rapture doctrine( hoax), on and on and on….COME OUT OF HER "MY" PEOPLE! During the Roman Empire "THE SUN" came to be worshiped as the Invincible-Unconquerable regenerative, life-giving force OF ALL THE EARTH. The bible positively states: YESHUA created all things! "And now, in pomp, the peaceful kings appear, Four steeds the chariot of Latinus bear, Twelve golden beams around his temples play, To mark his lineage from the god of day." The "golden beams" around the head of Aesculapius were intended to mark the same, to point him out as the (child of the Sun), or the Sun incarnate. The "golden beams" around the heads of pictures and images were intended to show the Pagans that they might safely worship them, as the images of their well-known divinities, though called by a different name. Now Aesculapius, in a time of deadly pestilence, had been invited from Epidaurus to Rome. From that time forth, in private as well as in public, the worship of the Epidaurian snake, the serpent that represented the Sun-divinity incarnate, in other words, the "Serpent of Fire," became nearly universal / (CATHOLICISM). Now, if this worship of the sacred serpent of the Sun, the great fire-god, was so universal in Rome, what symbol could more graphically portray the idolatrous power of Pagan Imperial Rome than the "Great Fiery Serpent" (great red dragon)? The Sunburst of gilt (gold) embroidery on the back of the vestments of the Catholic Priesthood signify the priest is also an "Emissary and Representative" of "SOL INVICTUS" (The Invincible Sun). 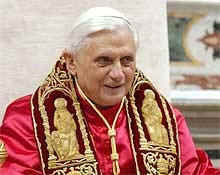 Benedict wearing the golden Luciferean vestments of Babylonian "Mystery" Religion (fish hat / mitre etc. "MYSTERY" (BECAUSE IT WAS / IS SECRET! WILLIAM SCHNOEBELIN STATES: A SATANIC HIGH PRIEST MUST FIRST BE A CATHOLIC PRIEST! NOTICE ALL 3 PHOTOS (BELOW) ARE OF DIFFERENT PEOPLE! Please notice the Crucifix (TAU) that the Pope is holding up to the people. Study it closely, and you will realize that it is not a Traditional Crucifix. Rather, this Crucifix is known as a "Bent Cross". But, what does that mean? 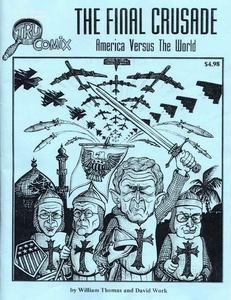 For the answer to that question, let us turn to a Roman Catholic author, Piers Compton, writing in his book, "The Broken Cross: Hidden Hand In the Vatican", Channel Islands, Neville Spearman, 1981. This Bent Crucifix is: " a sinister symbol, used by Satanists in the sixth century, that had been revived at the time of Vatican II. This was a bent or broken cross, on which was displayed a repulsive and distorted figure of Christ, which the black magicians and sorcerers of the Middle Ages had made use of to represent the Biblical term 'Mark of the Beast'. Yet, not only Paul VI, but his successors, the two John-Pauls, carried that object and held it up to be revered by crowds, who had not the slightest idea that it stood for anti-Christ." 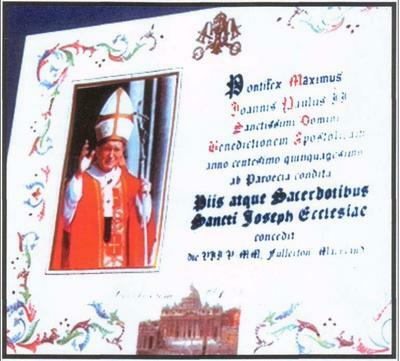 (p. 72) On page 56 Compton prints a picture of the last Pope, John Paul II, holding this bent or broken cross, just as we have shown, above so is Ratzinger the current Pontifex Maximus. Again, bear in mind the golden vestments. Pope Gregory VII (1073-85) : "The pope cannot make a mistake." Pope Paschal II: (1099-1118) "Whoever does not agree with the Apostolic See is without doubt a heretic." Pope Innocent IV (1243-54): described himself as "the bodily presence of Christ. "( presumably by a kind of transubstantiation at his election) Pope Boniface VIII (1294-1303) : "Every human being must do as the pope tells him." (Pope Boniface VIII, the Bull: Unum Sanctam, 1302: "We declare, say, define, and pronounce that it is absolutely necessary for the salvation of every human creature to be subject to the Roman Pontiff"
"[The Holy Roman Church] firmly believes, professes and teaches that none of those who are not within the Catholic Church, not only Pagans, but Jews, heretics and schismatics, can ever be partakers of eternal life, but are to go into the eternal fire 'prepared for the devil, and his angels' (Mt. xxv. 41), unless before the close of their lives they shall have entered into that Church; also that the unity of the Ecclesiastical body is such that the Church's Sacraments avail only those abiding in that Church, and that fasts, alms-deeds, and other works of piety which play their part in the Christian combat are in her alone productive of eternal rewards; moreover, that no one, no matter what alms he may have given, not even if he were to shed his blood for Christ's sake, can be saved unless he abide in the bosom and unity of the Catholic Church." (Mansi, Concilia, xxxi, 1739.) (Pope Eugene IV, Bull Cantate Domino, 1441). Thomas Aquinas, Rome's "Angelic Doctor" wrote in his Summa Theologica in 1272: 24. 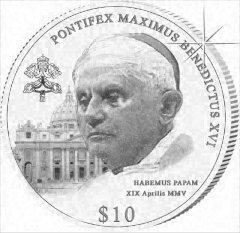 "The Pope, by Divine Right, hath Spiritual and Temporal Power, as Supreme King of the World." Lucius Ferraris wrote in his Bibliothica Prompta (1763), which has been adopted as a standard of Roman Catholic law, as follows: On account of the excellence of his Supreme Dignity, he is called Bishop of Bishops, Ordinary of Ordinaries, Universal Bishop of the Church, Bishop or Diocesan of the world, Divine Monarch, Supreme Emperor and King of Kings. Roman Catholic Priest and editor, David S. Phelan paraphrased those words when he wrote in the Western Watchman, June 27, 1912: "Why, if the government of the United States were at war with the Church, we would say tomorrow, To Hell with the government of the United States; and if the church and all the governments of the world were at war, we would say: – To Hell with all the governments of the world. Why is it the Pope has such tremendous power? Why is the Pope the ruler of the World? All the emperors, all the kings, all the princes, all the presidents of the world are as these alter boys of mine." Exposing the "Novus Ordo Seclorum"! JUST KNOW AND BE AWARE… THE WHOLE LINEAGE OF POPES HAVE BEEN AND "ARE" (THE ANTICHRIST)! THIS AS TAUGHT BY THE BIBLE AND ALL THE REFORMERS!